Note: I originally wrote this post for the inkcsape tutorials blog, but i liked this tutorial enough to do a shameless crosspost here on my personal blog. Here is another great inkscape tutorial from vectortuts, demonstrating how to create a vector lightbulb icon within the tango! icon guidelines. Also, be sure to check out the vectortuts website. Even though there are only a handful of inkscape tutorials posted there, if you have intermediate to advanced inkscape skills, you may be able to apply some of the techniques from the other tutorials hosted there. Note: This tutorial only demonstrates the process to create the light bulb icon above. The image below is a random subset of images that are in the tango! icon library. To get the tango! 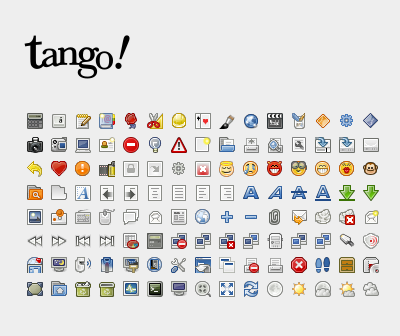 icons, including icons in the Scalable Vector Graphics (SVG) format, visit the download page on the tango! website.